Is Bigfoot More Human Than Neanderthals Were? From what I’ve read lately, it may be time to scrap most of our old beliefs about human evolution and open our minds to MANY new ones. As rumors swirl of Bigfoot being a primate that is more human than ape, new ideas develop about the human story every day. But I found none more interesting than theater and film director Danny Vendramini’s theories about Neanderthals that challenge some of the greatest minds in the scientific and anthropological communities in their traditional views of what Neanderthals must have looked like. Vendramini claims humans use anthropomorphism (the tendency to attribute human features to other animals) as the reason science has “humanized” the appearance of Neanderthals so much over the years. Neanderthals are usually depicted in magazines and on TV as hairless like us, light skinned, and often fairly attractive from a human perspective. They’re shown to look mostly like us outside of a few prominent facial features such as flat, short foreheads and heavy brow ridges. But Vendramini, in his book, Them and Us, in his background and working with movie makeup artists, has taken a new look at neanderthal skulls from a more theatrical point of view and has come to some interesting conclusions by using an old-fashioned human super-power: imagination. And an open mind. According to Vendramini, science has no basis to believe that Neanderthals looked much like humans at all. Neanderthals skulls have very large eye sockets, so they’re eyes had to, he says, have been much larger than a humans, possibly for the purpose of hunting in the dark of night. And like other primates, their eyes may have been completely dark with no whites, since there is no evidence to prove they had whites in their eyes. And he maintains we have no reason to believe they had light, smooth skin like humans either. With only fossil records to go by, we’re only assuming they had skin like ours. And Neanderthals are believed to have evolved in the colder northern climates of Europe and Asia, so complete hair loss like that of humans, believed to have evolved in the hot climate of Africa, would have been a huge mistake of nature...which doesn’t generally happen. There’s a very good chance Neanderthals were completely covered in hair just like any other primate except humans. And when we look at a side view of a Neanderthal skull vs. a human skull, we find the Neanderthal skull to look more like an ape than any human. So their profile would have looked much different than ours. So when Vendramini revealed his version of what a Neanderthal likely looked like, the picture was very different and, in my opinion, much more menacing than the more humanized, National Geographic version. And I was shocked to see what looked to me like a shorter, more fearsome relative of what Bigfoot is believed to look like today. In fact, in photos of Bigfoot, I believe Bigfoot as we understand him, appears much more human in that context than Vendramini’s Neanderthal. Send us an Email Help us! 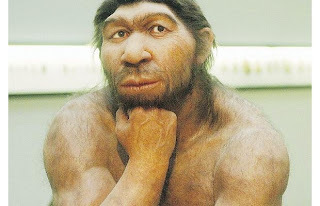 Vendramini claims that, somehow, neanderthals raped human females; however, if neanderthals were more closely related to apes than to humans, reproduction between these two would be impossible. Fossils tell us that Bigfoot could not be in the Homo lineage because humans are the tallest of any primate. None of our ancestors were taller than us. A seven-foot-tall, bipedal, hairy primate may be a type of orangutan, particularly Gigantopithecus. However, before we can suggest any of this, someone needs to prove that Bigfoot actually exists. Actually evidence suggests that some H. Heidelbergensis populations in africa reached heights in excess of 7 ft and were more robust than modern humans. And since H. Heidelbergensis supposedly evolved into the neanderthals and homo sapiens, nothing says they couldn't have branched off into yet another species of man. And what would heidelbergensis look like if Vendramini's theory was correct? Also another candidate to consider may be Meganthropus Robustus. I can only find one reference for seven-foot-tall heidelbergensis specimens: http://www.thenakedscientists.com/HTML/content/interviews/interview/833/ I would actually like to see a skeleton. Neanderthals and Heidelbergs were more closely related to modern humans than to any other primates. To suggest that they had hair all over their bodies like most primates is absurd due to the fact that humans are hairless. It seems to me much of our cultural references, that have lasted thousands of years, point to our need to distinguish us from them. Our obsession with body hair, and the desire to rid ourselves of it, point to this. As do comments like, "low brow"..the list is long of ways we try and elevate ourselves above Neandertals and other hominine living concurrently. We know now, at least as recently as 17,000ypb, H. florensis was around, and since you and I know BFs are living today, seems that pressure to elevate and distinguish never went away... cave men! To Taylor: actually H. erectus was taller than H.sapien back 200,000 years ago.. Turkana boy is a good example. I think BFs are an evolved H.erectus, perhaps via H.hidelbergensis. H. erectus was in Asia even before the shrink back and re-expansion of modern humans 75,000 years ago from Africa. H.erectus was also ubiquitous, an extremely successful species. With little evidence of material culture or art. ....either is a good bet..or Denisova too.... but genus Homo seems very likely and would fit the my field data. Homo erectus and Homo heidelbergensis didn't have hair covering their bodies. They both wore clothes (which there is evidence of), constructed fires (also evidence of that) and most important of all, had sweat glands. These sweat glands wouldn't have evolved if erectus and heidelbergensis had a full coat of hair like Bigfoot. However, firstly, there must be evidence that Bigfoot exists. Do you have evidence that the squatch doesnt sweat? We don't know how much hair erectus and heidelbergensis had--hair isn't fossilized. The use of fire could truly be irrelevant. Maybe at one time the squatch could use fire--we don't know. But what does make sense is if they evolved to be mostly nocturnal and wanted/needed to elude the destructive nature of modern humans, what good would fire do them? They can function at night! Lets say they branched off from heidelbergensis before heidelbergensis learned to use fire--I mean, its all speculation and the possibilities at this point seem endless. Like I've already said, you need to have evidence that Bigfoot exists in the first place. However, it is believed by many researchers that the evolution of skin glands is what eventually led to hairlessness in the human lineage. There is evidence that fires were being made by Homo erectus/ergaster over one million years ago,* long before heidelbergensis evolved. I am in a desperate push to find a CRYPTO Speaker for my Paranormal Conference this weekend. 1st Annual Mid-Continent Paranormal Conference in Kansas City this weekend 8/3 & 8/4. I have not been able to find one that is able and i don't want cryptozoology to be unrepresented. Do you know anyone that may be interested? Can you put the word out. My email is jasonk@midcontinentparanormal.com my phone is 913-945-0097. Thanks. Hope to here from you. www.midcontinentparanormal.com/conference.html for all the details! I think bigfoot is a branch off of H. Heidelbergensis for one reason: some populations contained individuals that were over 7ft tall. All parties have valid arguements because of lack of evidence! And how come no one has shot bigfoot hunting or got footage of one? there are many reports of bigfoot being shot. The guy who killed 2 in Texas,Justin Smeja recently reported killing 2 as well ..plus other reports. Why Can’t You Just Hold That Camera Still? 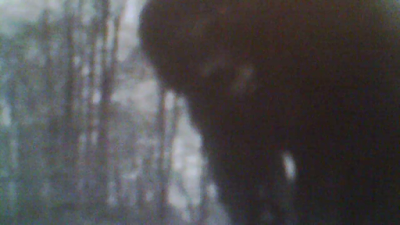 Is this a Bigfoot caught on a game cam? Game Cam photo of "something"
1st Annual Mid-Continent Paranormal Conference! The elusive snow leopards Filmed! Bigfoot track found in Norway? New Zombie Type Attack in China!